German Wirehaired Pointers trace their origins back to the late 1800s. They originated in Germany, where breeders wanted to develop a rugged, versatile hunting dog that would work closely with either one person or a small party of people hunting on foot in varied terrain; from the mountainous regions of the Alps, to dense forests, to more open areas with farms and small towns. The breed the Germans desired had to have a coat that would protect the dogs when working in heavy cover or in cold water, yet be easy to maintain. The goal was to develop a wire-coated, medium-sized dog that could search for, locate and point upland game; work both feather and fur with equal skill; retrieve water fowl; be a close-working, easily trained gun dog; be able to track and locate wounded game; be fearless when hunting sharp game such as fox; be a devoted companion and pet; and, be a watchdog for its owners’ family and property. In 1959, the breed was recognized by the American Kennel Club. 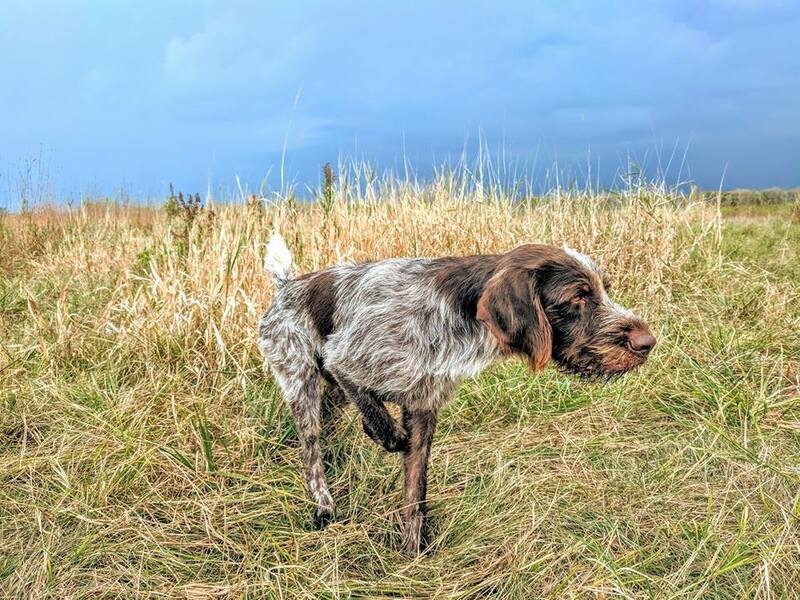 The German Wirehaired Pointer Club of Illinois is a regional club of the German Wirehaired Pointer Club of America which is focused on promoting the German Wirehaired Pointer in the state of Illinois. We support the versatility of the German Wirehaired Pointer and our members actively participate in hunting, conformation, obedience, rally obedience, agility, tracking, dock diving, and barn hunt. Beth has owned GWP since 2012, her first GWP is Tycho. She’s been hunting since 2010 and has done both retriever and pointing dog hunting. She’s been competing in canine performance events since 1992. Competition has included dock diving, obedience, barn hunt, conformation, hunt tests, field trials and rally obedience. Her versatile GWP is titled in 7 different sports, including AKC, UKC, NAVHDA and other venues. She has a background in canine rehab as a physical therapist. Ashlee has had GWPs since 2002. Agility and barn hunting are her primary performance sports, but she's titled GWPs in Obedience, Rally Obedience, Tracking, Dock Diving and Bird Hunting. Her Spirit was the first MACH2 male GWP and second overall. He was a finalist in both the AKC Agility Invitational (2008) and the AKC Agility National Championships (2010). Her Creek is the highest titled GWP in barn hunting - he currently has 7 barn hunt championships the highest titled GWP. Youngster Giddy has several barn hunting titles and has recently started competing in Dock Diving as well. Ms. Molly is the queen of the homestead - she has been a welcome addition from National German Wirehaired Pointer Rescue (http://www.nationalgwprescue.com/). GWPs are smart and enthusiastic dogs that can find a way to learn and excel at just about anything you'd like. Just has experience in both retriever and pointing dog hunting in AKC hunt tests, NAVHDA events and personal gun dog hunting. He currently has a lab, a GWP, and a GSP. When he’s not working to keep the lights on (literally) he enjoys hunting and encouraging the longevity of the sport with youth hunting events. Open - could it be you? We are currently have an open position on our slate of club officers. Would you like to be more involved with the club? Let us know you’re interested!